Gym climbing, indoor rock climbing, or sport climbing are sports that take an outdoor activity and bring it into a controlled, safe environment. This non-competitive but exhilarating sport provides many people the thrill they need without the outdoor rock climbing danger; it is typically performed with another person, so this increase the bonding experience between the people. Indoor rock climbing is an adventurous sport that anyone can enjoy, but there are some things one must take into consideration before attempting the sport. 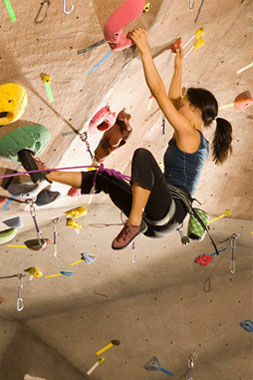 With indoor rock climbing you are able to emulate any angle and rock formation. On the most rudimentary level, the activity attire comes to mind first—a great pair of shoes, harness, ropes, belays device, hardware, and a few other smaller articles of experience. If one is an entry level climber, look for a shoe that focuses on function and comfort. These are two traits that will most pertinent when one is scaling any formation. The last thing you want is the rubber in your shoe to wear out when you need it the most. Your toes need to fit snug—this will prevent sliding. Several companies focus strictly on shoes. The La Sportivasports gear company makes an entry-level mountain climbing shoe that is called the Nago. This is a great shoe that will walk one through the mountain climbing process. A harness and rope are the next two pieces that one must have to ensure a safe adventure. The type of harness one would need is dependent on the activity. If one wants to partake in sport climbing, then one would require quick draws—a carabiner with short pieces of webbing attached two together. A carabiner clip clips into the bolt and one into the rope. If one would like to try “crack-climbing” one would need to invest in a rack; now these racks can be difficult to carry, but it offers a cornucopia of rewards. This can be a great hobby that becomes a deep passion. And if it progresses, consider some of the nonessential essentials like tape, chalk, sandpaper, brush, helmet, and bandana. Tape can be used to create a barrier between skin and rock. The chalk provides a helpful grip. The sandpaper should be used to sand down your skin—the smoother the skin, the smoother the trip. A brush should be used to clean excess powder on the rocks. Too much powder left on the surface can cause slippage, which could result in injury. 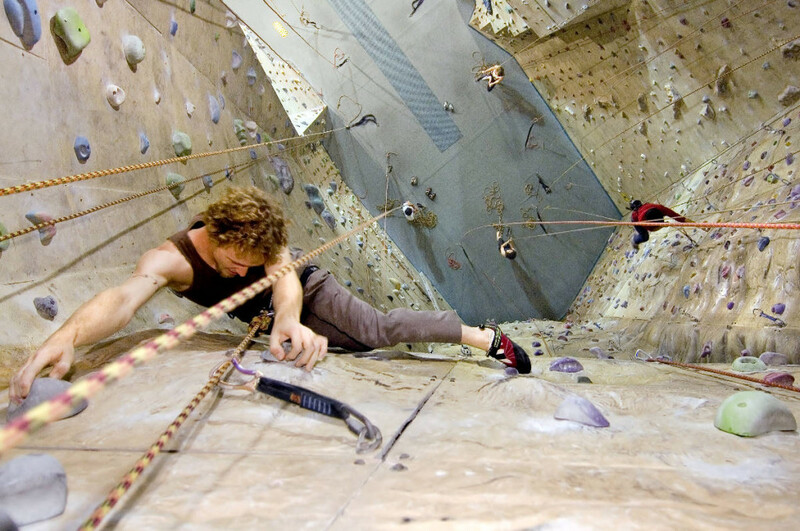 Indoor rock climbing is the best environment for outside bouldering because it provides a controlled environment Gym climbing or “sport climbing” uses pre-bolted “sport” routes. It provides entertainment to a wide-spread audience, and it is typically done with a partner, which makes it a great social tool—not to mention the great physical benefits. Though all gyms differ, most gyms provide top-roped climbs with heights varying between 20 to 60 feet, and top-ropes are rated by skill-level, 5.7 for novice and 5.14 for expert. Safety is ensured with the belayer who remains on the floor, attached to the belay device. Not indoor climbing isn’t just for beginners, it is very popular with skilled climbers. A common practice with skilled climbers is called “lead climbing.” This replaces the top-rope, the lead climber is tied into an end of the rope and clipped into anchoring devices (quickdraws), which are already attached to bolts. Some gyms may not require you to wear a harness but instead require the use of a crashpad.